Eric is an AV Preeminent rated litigation attorney who focuses on personal injury, construction and employment matters. He defends individuals and companies in general liability, premises liability, contract, and construction defect matters. He has successfully represented contractors of all kinds from graders to roofers and all types in between. He handles volume client construction cases and successfully obtains consistent global resolutions avoiding typical and costly litigation expenses. Eric has extensive experience defending clients in general liability matters, including complex personal injury claims. He has also handled numerous cases involving products liability claims for a major manufacturer. He has tried a number of cases to verdict, either as lead or co-counsel. 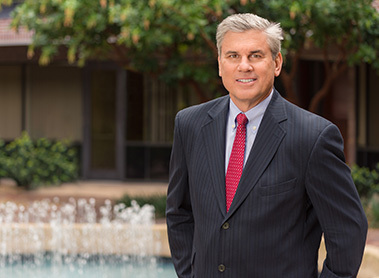 He has extensive experience representing clients in arbitrations, mediations and mandatory settlement conferences. Further, he has handled appellate matters and argued in the Fourth Appellate District and the Superior Court Appellate Division. In addition, Eric represents employers and provides advice and training on a full range of employment law issues, including drafting employment policies and procedures, terminations, and discipline. He has defended employers in a wide variety of matters, including claims for discrimination and wrongful termination, FEHA claims, EDD issues, matters before the Labor Board, and civil suits in the state and federal courts. Before beginning his legal career, Eric spent over six years handling claims in the insurance industry. He also had a series 7 license which certified him to handle the sale of securities and sold insurance for a major insurance company. Prior to joining Liedle, Larson & Vail, LLP in 2010 as a partner, Eric spent 15 years as an attorney with previous firms defending general contractors, subcontractors and developers and providing counsel regarding employment matters. He is familiar with all aspects of construction and employment related litigation and has handled multiple construction cases involving a wide range of claimed defects. Among other affiliations, Eric is a member of the San Diego County Bar Association and has served on panels for adjuster relations with plaintiff's counsel for the Bar Association. When away from work, Eric enjoys his family, plays basketball in his spare time, and travels whenever the opportunity arises.